Union cannon in original positions for the Siege of Vicksburg, Mississippi (1863). VICKSBURG, MISSISSIPPI — The Wooster Geologists southern USA team spent the better part of the day at the site of the Civil War Battle of Vicksburg (May 18-July 4, 1863). As is the case with virtually every battle, the local geology played a prominent role here. Union forces wanted complete control of the Mississippi River to maintain communications with the northwest, to split the Confederacy into two large parcels, and to deny the South the use of the river for transport. Vicksburg held the key, as President Lincoln said, to the Mississippi and maybe the success of the Union war strategy. General U.S. Grant had an innovative (and expensive) plan to attack the fortress city from the land side to the east. To do that he faced a series of fortified bluffs which protected the city’s flanks. 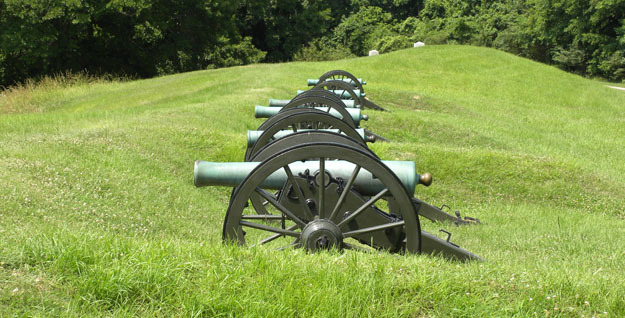 Several direct Union assaults on these bluffs failed, so a long siege of Vicksburg began until it surrendered for want of supplies and low morale. 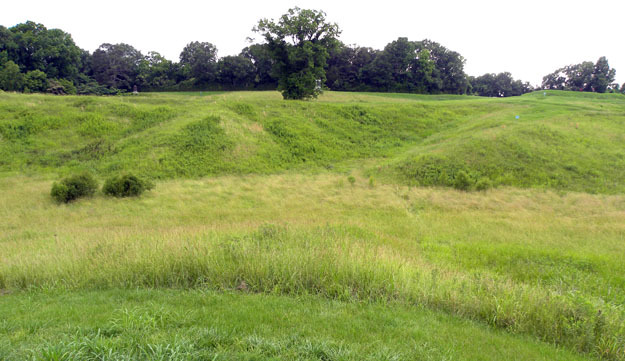 Part of the battlefield in the bluffs just east of Vicksburg. Looking from the Union lines to the Confederate positions. The immediate geological issues are derived from the Mississippi River and its ancestor. At the end of the Pleistocene the glacial meltwaters flowing south through this area were tremendous, producing a vast braided stream complex. Sediment from these channels was picked up by the wind and deposited in parts of the Mississippi Valley as thick layers of loess. 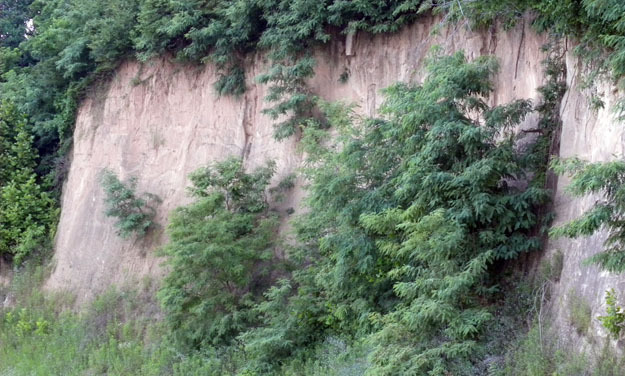 Loess is an unusual sediment because it is highly uniform in composition (silt-size subangular particles and clays) and it has a very high angle of repose (meaning it erodes into very steep slopes — cliffs, really.) As the later Mississippi River meandered through its valley, it cut a series of bluffs at its easternmost extent at Vicksburg. The city thus has a port on the river surrounded by high bluffs well suited for artillery to protect all approaches. A loess cliff exposed on the side of a bluff in the city of Vicksburg. Since loess sticks together so well, it is useful for digging entrenchments and caves for protection from artillery and rifle fire. Many people in Vicksburg lived in loess caves during the siege to protect themselves from Union cannon fire. 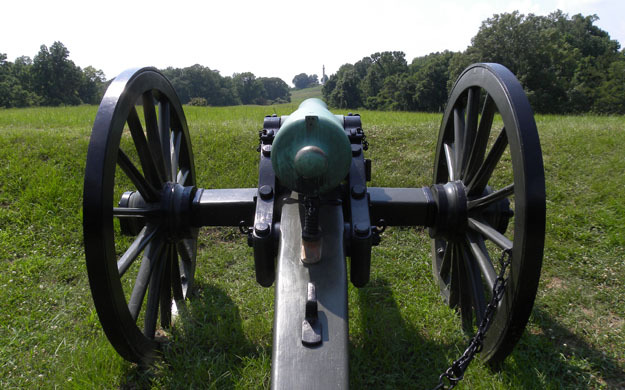 Cannon on the Union line aimed towards a Confederate position in the Vicksburg bluffs. We can’t say that geology controlled the Battle of Vicksburg — there are numerous and decisive factors of human courage, persistence and innovation — but we can conclude that both sides had to adapt to the geological circumstances in both military and civil ways. 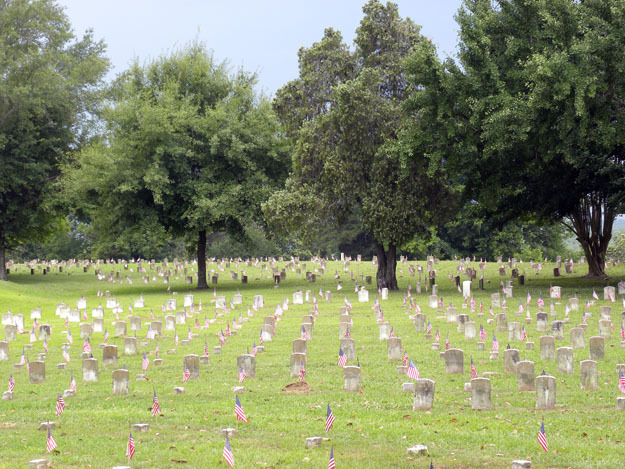 Vicksburg National Cemetery. We never want to forget the cost of war. That the ages of most of the soldiers etched on the tombstones is that of present college students is especially poignant to us. Since this is our last post from the Alabama and Mississippi summer 2010 geological team, we would like to thank our excellent guides Jon Bryan (Northwest Florida State College), Peter Harries (University of South Florida), and most especially George Phillips of the Mississippi Museum of Natural Science. George spent days with us, giving us access to sites and people we could never have dreamed of meeting on our own. Even more important, he is an excellent paleontologist with encyclopedic knowledge of Mississippi fossils, both invertebrate and vertebrate. Through the generosity of George and many others, we have material for many future Cretaceous-Tertiary paleontological projects. This trip has been an excellent example of the collaborative nature of geology.